Durasil Sealant - Old World Distributors, Inc.
24 - 10.1 oz Cartridges - 20 lbs. Can Be Installed At Any Temperature, Cures At Any Temperature. Remove all dirt, oil, loose paint, frost and other contamination from all working surfaces with alcohol. DO NOT USE petroleum solvents such as mineral spirits or xylene. 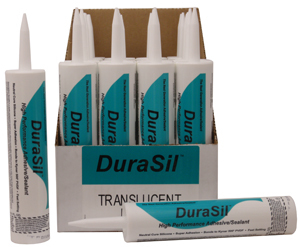 Keep Durasil at room temperature before application to ensure easy gunning and leveling. If tooling is needed, do so within fifteen minutes of application. Clean up with alcohol.